Ziad Abs: "I have been arrested 30 times in the last ten years"
Ziad Abs, Political Bureau of the Free Patriotic Movement (FPM) - General Aoun's movement: "Now our primary task is to see the Syrians out"
WSN: Ziad, when did you become active in the Free Patriotic Movement and what is your current position? 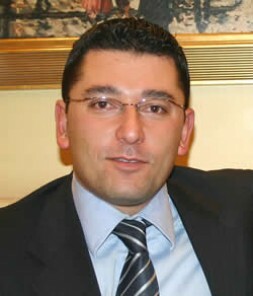 Ziad Abs: I joined the movement in 1990, after General Aoun left the country. Since then I have held several positions, and now I am part of the group that handles the political contacts of the FPM inside and outside Lebanon. WSN: You have been arrested numerous times by both the Syrian and Lebanese intelligence services. Can you share a few of your experiences with us? Ziad Abs: I have been arrested 30 times in the last ten years: Two times by the Syrian intelligence directly, and the other times by the Lebanese intelligence that was working under Syrian command. In 1994, they arrested and took me to the Syrian intelligence headquarters. They arrested 300 political activists, saying that someone placed a bomb at one of their brigades in the mountains. We never found out if a bomb had really been placed there or if this was merely a pretext. I was held for two days. It was a terrible experience, because of the shouting and beatings of people. I could only wonder when it would be my turn. The psychological effect was very powerful especially because I, along with the other prisoners, was handcuffed and blindfolded. After 48 hours, Rustom Ghazale called me into his office. He was very nice and polite. He started by telling me that General Aoun is a very patriotic man, and he does not blame me for being part of his movement. However, I am a young man, thus I will need some support to get around. The whole story was about his attempt to find new collaborators. He gave me his private number, saying that he would be my guardian angel if I accepted the offer, which I obviously did not accept. One of my toughest experiences was in the jail of the Ministry of Defense. We had organized a large demonstration for 14 March 1989, when we planned to deliver a letter to the UN headquarters to show our full support for UN Resolution 520. This resolution condemned the murder of Bashir Gemayel and asked for the withdrawal of all non-Lebanese forces from Lebanon. Unfortunately, the intelligence service found out about the plan, and there were roadblocks in order to prevent our arrival at the headquarters. While leading the group, I noticed a guy on a motorcycle delivering pizza. I thought that if we could not get there as a group, then at least I could get there and deliver our message. So, I took the motorcycle and put the letter inside the pizza box. The army let me pass and once I was in the UN building, I told the security agent the story. He told me to wait and suddenly the police, army and intelligence agents rushed inside the building to arrest me. Instead of working for the UN, the security agent was actually a Syrian collaborator. They took me to the jail in the Ministry of Defense. For 48 hours I was forced to stand on my feet, facing the wall, completely naked, and every time I tried to place my chin on my chest, someone slapped me. It was very demoralizing. At first, I had no idea where I was. They took a long detour so I thought that I was perhaps in Syria, especially since I heard soldiers around me speaking with a Syrian accent. After these 48 hours, they took me to the interrogation room. They asked me questions they had asked me a few years ago when they first arrested me, to compare the answers. Afterwards, they brought me paper and pencil to write down what I had told them during the interrogation. WSN: Did you think about renouncing the position you held in the FPM? Ziad Abs: After more experiences like what I've described to you, I decided to step down from my position with the FPM. I was not doing well at the university, and I had no normal life. Thus, I was out of action for two months. Then something happened and I changed my mind. One day, I observed a car following me. I took some turns, but it still followed me. Then they signaled me to stop. The captain was from the Beirut intelligence and I knew him, because he had arrested me three times in the past. In essence, he told me the following: "I know you decided to stop, but let me tell you that we are still in the army, because there are people like you still asking for the freedom and independence of the country. What we cannot do now, you are doing. But if people like you would retreat, then eventually there would be nothing left to give us hope." It was a turning point for me. I decided to take up my responsibilities again. WSN: During your experiences, could you call your family, friends or your lawyer? Could you let someone know about your situation? Ziad Abs: In the first years of the resistance, nothing was organized. People were arrested, and we did not know where they were being held. Eventually, we observed there was a pattern to the system and we organized ourselves to fit the system accordingly. When one guy was arrested, he had to try to call someone else to let them know. The person that was informed would then proceed to place pressure on the intelligence services by informing the media and international organizations. This would cause a scandal and if the scandal was too great, the Syrian or Lebanese intelligence would release the prisoner(s). WSN: What is the state of relations between other parties and the FPM? Ziad Abs: For the opposition parties, it's clear that we are working together in the freedom revolution and we agree on several issues. Before the assassination of Mr. Hariri, the priority was not to get the Syrians out of Lebanon; some thought that this aim was too difficult to achieve without pressure from the international community. Therefore, most would have been satisfied to change and modernize the chaotic socio-economic and judicial systems. However, now our primary task is to see the Syrians out, and then step-by-step we will get to the other issues we need to solve. We have weekly meetings with the opposition, and a few weeks ago we began a more constructive dialog with Hezbollah. With Amal there are contacts, but not a serious dialog. There is respect for what Hezbollah did for Lebanon, and we in the FPM understand their position because we have resisted the Syrians, as well. But they should disarm themselves - not immediately, but it is a goal that must be reached in the near future. WSN: Some of the opposition members and even General Aoun seem to believe that the Taef Agreement is more suitable than UN Resolution 1559. Actually, both are asking the very same thing. What is behind these declarations? Ziad Abs: Everyone wants to see Hezbollah disarmed, but some fear that if they look too eager to implement UN Resolution 1559, they will look too pro-American. Therefore, they ask for the implementation of the Taef, which stipulates that all militias be disarmed. Hezbollah sustains that it is not a militia, but a resistance. Nonetheless, they will have to lay down the weapons, because we cannot have a country ruled by law and a democratic system while this, or that group controls a part of the country and has its own army. WSN: How do you see the democratization trend in the Middle East? Ziad Abs: The Americans will not replace the Syrians. They do not have the interest, or the influence the Syrians had here. 15 years ago, the US was not greatly interested in having a free Lebanon; now things are different. WSN: What are the future prospects of the FPM? Ziad Abs: We want to register as a political party, establish a clear hierarchy and emphasize our liberal ideology. Lebanon has 18 religions and we need a secular approach to ensure that what matters is citizenship, not a particular religion or community affiliation. The FPM is also lobbying for a more decentralized government - a government that will try to develop all parts of Lebanon, not only the Christian areas or for that matter the Muslim ones. We are presently concentrating on the total withdrawal of Syria and then we need to filter the political class and get rid of the corrupt individuals that had been placed there by the Syrians. In a year's time, many things will have changed in Lebanon. I am sure we will have some new political parties that are more pragmatic and liberal-oriented to replace the classical ones. WSN: Thank you very much, Ziad for your comments. Manuela Paraipan was awarded the 2005 Scholarship of the World Security Network Foundation. She is a Bucharest based independent foreign policy analyst. She has been published in The Washington Times, World Press, Yemen Times, Global Politician, Lebanon Wire and other publications. She has also been invited as a speaker at multiple political conferences.